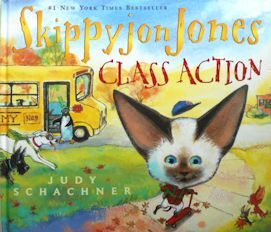 This children's cat book tells the story of Siamese kitten Skippyjon who is determined to go to school. At school he has a series of adventures. The text is sprinkled with numerous word in Spanish. Brightly colored illustrations on each page. The hardback book is 10 1/2" wide x 9 1/4" high, 30 pages. Copyright 2011, first edition. Previously owned but in good condition.